If you're thinking that the smartwatch world is slowing down, then think again. Pebble is back with another range of devices, all aimed at the health-conscious tech fan. The key part there is 'devices' - for the first time the company is breaking out of the smartwatch market to bring a fitness-centric wearable into your life, with the Pebble Core joining the Pebble 2 and the Pebble Time 2 in the brand's line up. What's interesting is that, for the third time, Pebble has gone back to its Kickstarter roots to sell the devices - after two successful launches so far, it'll be interesting to see if consumers like the idea of pre-paying for smartwatches and fitness trackers ahead of time on the crowd-funding site. The Core is a standalone 3G-enabled device that combines GPS and Spotify to bring an impressive array of features to a small clip-on unit that costs just $69 (around £48 / AU$95). The Core also features the same one-button approach that's been baked into recent Pebble devices, allowing you to call an Uber with a single touch despite not having a smartphone around. The Core works (presumably) by connecting to a smartphone initially for set up, as there's no screen on the device. From there you can control how the thing will work during a run, and decide where to keep the data: Runkeeper, Strava and Google Fit are supported among other popular fitness data platforms. What's interesting is this device features its own 4GB of internal storage as well as running on Android - with up to 20 hours of battery life if you're just using the GPS alone, and the ability to send an emergency text to a chum if you're in trouble. Available to fund now, the Pebble Core will start shipping in January 2016. Pebble is still keeping true to its smartwatch beginnings though, by rebooting the first Pebble watch and the more fashion-conscious Pebble Time with the nattily-named Pebble 2 and Pebble Time 2. Both watches now feature inbuilt heart rate monitors to complement the activity tracking that's been recently added into Pebble OS, so you'll be able to keep an eye on your steps and sleeping patterns with the new wristwear. Firstly, there's the Pebble Time 2, arguably the biggest upgrade of the two... mostly because it actually HAS been properly improved. The screen is now much sharper at 200x228 pixels in the 1.5-inch square screen (we're expecting a Pebble Time Round 2 to appear in the next few weeks too). The Pebble Time 2 has an e-ink multi-color display, and the innards have been improved to allow for a ARM Cortex M7 CPU, which should deliver a fairly hefty speed boost over the previous M4 (now being used in the Pebble 2). The Time 2 is coming in Black, Silver and Gold but, crucially, is created in stainless steel, making it the clear choice if you're not into wearing a plastic watch on your wrist. The battery life is upgraded to 10 days, compared to the 7 the previous model reportedly got. That might go some way to explaining the weight hike, which is up from 42.5g to a let's-be-honest-still-not-heavy 65g, especially as it now packs in a heart rate monitor and retains the swim-proof casing to protect in the event of accidental dunkings. That's, surprisingly, also available to fund today for $169 (around £115 / AU$235) but will be shipping in November. The Pebble 2 doesn't seem to have been given much of an upgrade beyond that from the two-year-old original, as it'll still sport the same monochrome e-ink display as before, with 144 x 168 pixels. However, it's lighter at just under 32g and without the heart rate monitor bump (which is still there, so why Pebble removed it from the spec is unclear) it's only 9.8mm thin. There's an upgraded ARM Cortex M4 CPU running the show, and it's still got the impressive 7 day battery life and water resistance that'll let you take it in the swimming pool. The colors available at launch will be Black, White, Blue, Green and 'Flame'... we're still not sure what that one is. Coming at a Kickstarter price of $99 (around £68 / AU$140), with $129 (around £90 / AU$180) expected to be the retail cost, it's available to fund now and will be shipped in September. 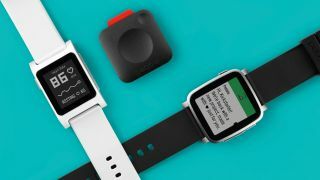 Whether you're for or against the Kickstarter way of buying Pebble products initially, there's no doubt the company isn't giving up on its product portfolio, despite recent reports of staff layoffs - so if you're after a watch that can last for days and work with Android or iOS, Pebble still thinks it can win your dollars.